Bowel incontinence, also known as faecal incontinence is a surprisingly common condition in both men and women. There is currently an under-reporting due to patients’ reluctance to talk about the condition. This results in many people being unaware of the bowel incontinence products that are available to them. A study in 2014 aimed to identify daily problems in individuals with faecal incontinence. 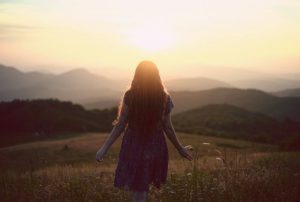 The key issues found included poor self-affirmation, guilt and shame and limitations in life. The study also explored different aspects of living with faecal incontinence and how they affected daily life. Every participant agreed that incontinence is a highly distressing and “social incapacitating” problem. According to the National Digestive Diseases Information Clearinghouse in the USA, as many as 60 percent of these people suffering from faecal incontinence do not look for a solution. It is vital that you do not suffer in silence. The market for incontinence products is becoming more varied and advanced. Due to the nature of faecal incontinence, disposable products are the only option. However, there is now a large variety of bowel incontinence products available in the market. For those who are mobile and active, absorbent pull-up underwear is the best option. Pull-up products enable the wearer to use them as they would normal underwear. Designed to feel just like regular, the pants feature the security of elasticated leg cuffs, an elasticated waistband and standing gather for extra protection. As they can be difficult to put on for some users, they are not recommended for individuals who are immobile. When you are shopping for pull up pants for faecal incontinence, it is important that you look for pants with the “Maxi” rating. This tells you that they are the most absorbent option in the range and are suitable for managing both urinary and faecal incontinence. An example of popular pants for faecal incontinence is the Tena Pants Maxi. They feature a unique dual absorption zone and provide a body-close fit to ensure maximum protection. You can purchase Tena Pants Maxi from an online incontinence store here. All in ones often hold the greatest amount of urine leakage in comparison to other options. These products are full sized briefs that wrap around the body and seal with reusable adhesive tape. All in ones are much easier to put on than pull up underwear. They are therefore recommended for less mobile or bed bound users who will benefit from the extra absorbency. All in ones contain anti-leak cuffs designed from waterproof material to provide added protection against leakage. All in ones also contain an odour control system to prevent the formation of ammonia. The majority of all in ones are belted, using a Velcro fixation system to enable fast removal. The integrated anti-leak cuffs designed from waterproof material provide added protection against leakage. in ones hold large amounts of urine and are suitable for people who cannot walk or stand or require a carer to change the pad. All in ones are often applied lying down. All in ones are recommended for people with moderate to severe faecal incontinence. They offer more security than a pad and higher levels of absorbency if the stools are very loose. Choosing a correct all in one depends on the whether the person has any difficulty getting to the toilet, if they have any health problems or whether they have skin reactions. Incontinent individuals with Dementia can often become distracted and distressed with wearing a bulky all in one. Often, it may be suitable to switch an all in one for a pant product if they are uncomfortable. 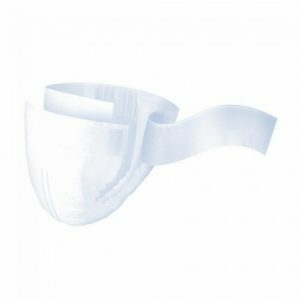 The iD Expert Belt Maxi is a popular all in one product that provides reliable protection for those with heavy to severe faecal incontinence. You can shop the iD Expert Belt Maxi online here if you think this could be the right product for you. Many manufacturers have designed discreet pads designed for faecal incontinence. It is recommended that you try these if your faecal incontinence is lighter. The ideal pad for you will depend on the severity of your incontinence and which design of pad you are most comfortable in. 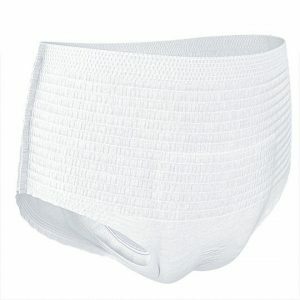 Pads are designed to be worn with firm fitting underwear or fixation pants. If you find your pads frequently slip out of place, special fixation pants are recommended to help increase security. 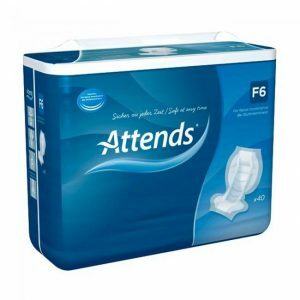 The Attends F6 Pads are popular pads that are designed for faecal incontinence. The pads include a white waterproof polythene back sheet and a full barrier leg cuff. If you are looking for a comfortable pad to manage faecal incontinence, the F6 may be the best choice of product for you. These are designed for use alongside Attends Stretch Pants Regular, Attends Stretch Fit Pants or Attends Stretch Pants Comfort. You can find the Attends F6 Faecal Pads online here. In addition to using an effective product, it is vital that you use barrier creams and moisturisers to protect the skin. Read more about how to use incontinence skin care products here.